He has lived in the United States for 26 years, but sometimes Amrish Thaker feels like he has journeyed home, half a globe away. Last Saturday night was one of those times. The room looked like a giant family reunion, smelled like the spices of a South Asian market and sounded like an Indian folk song. "It feels a little like home," said Thaker, a Greeley resident, as people sang and danced on a stage behind him at the Fort Collins Senior Center. It felt like home to about 250 others, many of them Indians who have lived in the United States for 20 or 30 years, raised their children here and return to India every once in a while. Saturday night ? their celebration of Diwali (dih-vah-lee), the Hindu New Year ? was one occasion in which they remember where they have come from and share it with others. The India Association of Northern Colorado sponsored the event. 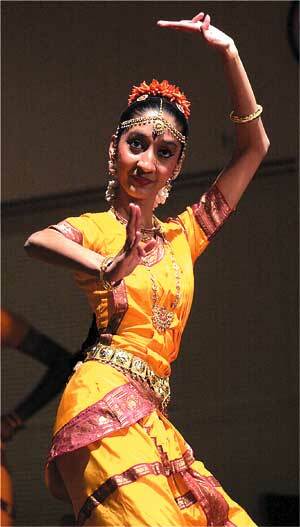 Sheela Bringi, 17, left, of Fort Collins performs a classical Bharatanatyam during a Diwali celebration. The celebration was only a small fraction of what it is in India, where Diwali is a five-day event that began Wednesday. In India, where Hinduism began and remains the dominant religion, you can feel Diwali in the air. Streets and homes glow with earthen lamps and electric lights. Homes and Hindu temples are fully cleaned and adorned with decorations. Corner stores stock up on multicolored sweets. Women buy new silken clothing trimmed with golden thread. Families and neighbors have parties and light fireworks. Last Saturday in Fort Collins, women left their American-style clothing at home and donned what one might wear to an Indian wedding ? green, purple and saffron saris, gold earrings and bangles that clatter gently every time they move their arms. 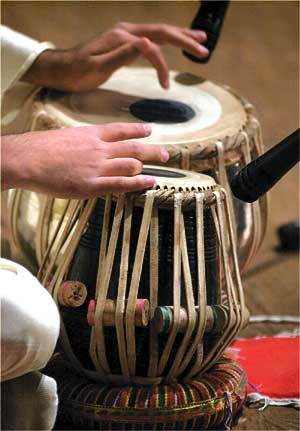 On stage, entertainment included Indian folk dances and songs; a performance on the tabla, a twin drum commonly used in Indian music; even some stabs at Indian humor. It was more of a social occasion than a religious one. But the religious significance of the evening was not lost. A small temple, with a picture of a Hindu god, sat on the stage. A garland of fresh flowers had been draped over the image. On either side sat two lanterns ? symbols of what Diwali means. Diwali comes from the Sanskrit word Deepavali ? deepa meaning "light" and avali meaning "a row." This festival of lights symbolizes the victory of light over darkness. According to Hindu mythology, Diwali marks the Hindu god Rama's homecoming to his kingdom Ayodhya after a 14-year exile. The holiday also honors Laxmi, the goddess of wealth. "It's one time of year you're actually encouraged to gamble," said Uma Mahesh Babu, a Fort Collins resident originally from Bangalore, a city in south India. "You celebrate the wealth you have and try to increase it." During Diwali, usually celebrated in October or November, the Zodiac enters the sign of Libra, symbolized by a balance. For businesses in India, Diwali marks the beginning of a new fiscal year. All business agreements ? traditionally done verbally in India ? must be met, and debts must be paid. 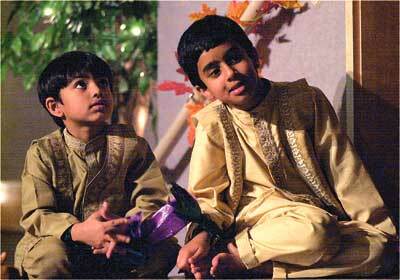 Chinmay Pandit, 6, left, and Akshay Kumar, 6, watch performers during the festivities. "From the northernmost part of India to the southern tip, Diwali is celebrated everywhere," Babu said. "There are hundreds of dialects in India and many regional differences, but during Diwali, we are united." The more than 200 Indians who attended last weekend's Diwali celebration in Fort Collins came from all 29 states in India. Two things unite them: Their home country and their choice to live in northern Colorado. With master's and doctoral degrees, some work as physicians, professors and in high-tech jobs in Greeley, Loveland and Fort Collins. Others run businesses like Indian grocery stores and restaurants. Several years ago, people like Thaker used to have to travel to Denver to celebrate Diwali with other Indians. Only a handful of Indian families live in Greeley. But the Indian population in northern Colorado has increased in the past few years. The India Association of Northern Colorado, which sponsors the Diwali celebration and community service projects, began in 1998. The organization's events draw Indians who live in Greeley, Loveland and Fort Collins. After Saturday, some families went home and celebrated the five days of Diwali on their own. In a special prayer ceremony, they may have recited the 108 names for the goddess Laxmi and taken ritual baths, or men may have given gold jewelry to their wives, all traditions associated with Diwali. But the most important of the traditions may have been the celebration in Fort Collins. They admit it doesn't come close to Diwali in India. There were no fireworks, no mounds of colorful sweets, no earthen lamps lighting up entire neighborhoods. Some of those who attended Saturday night's celebration have been away from India for so long, they hardly remember what the new year celebration is like at home. Their American-born children know only what their parents have told them. Still, they try to keep the cultural and religious significance of it alive. Vikas Malaiya, 16, of Fort Collins plays tabla drums during a Diwali celebration at the Fort Collins Senior Center last Saturday night in Fort Collins. "We are like a family," Babu said. "When we get together, it is like a little taste of India." more info n To learn more about the India Association of Northern Colorado, go to www.ianc-fc.org. Diwali began in ancient India, when it was an important harvesting season. Homes needed to be cleaned and painted to keep insects and fungus from breeding after the long monsoon season. As Hinduism developed, mythological stories were attributed to the festival to give it religious significance. Originally celebrated only by Hindus, Diwali ? one of India's largest festivals ? is celebrated by most religious communities in India today. Day 1: Dhanteras People clean homes and businesses and decorate the entrances with traditional designs to welcome Laxmi, goddess of wealth and prosperity. To indicate Laxmi's arrival, people draw small footprints with rice flour and vermilion powder all over homes. On this new moon night, Diwali lamps remain burning all night long to welcome Laxmi and the spirits of dead ancestors and to ward off evil spirits. In south India, people decorate and worship cows, who are thought to be the incarnation of Laxmi. Day 2: Narka- Chaturdashi Early in the morning, Hindus take ritual baths with oil and fragrant powders, put on new clothes, then have a large breakfast with relatives and friends. The bath may signify cleaning thoroughly after the monsoon months. Oil lamps illuminate the house in the evening; people light fireworks. Day 3: Chopada-Puja All doors and windows remain open so Laxmi can enter the house. The front door or the entryway is decorated with drawings or paintings of lotus flowers. Day 4: Padwa The financial new year begins. Husbands give special gifts ? usually gold jewelry ? to their wives. Day 5: Bhaiya-Dooj A man visits his sister, who applies perfumed oil on his head, arms and back before he bathes. She prays for his long and happy life. With 762 million followers, Hinduism is one of the largest religions in the world. It ranks third in number of followers behind Christianity and Islam. Hinduism is the dominant religion in India, Nepal and among the Tamils in Sri Lanka. About 1.1 million Hindus live in the United States. Hinduism has been viewed as polytheistic, monotheistic and a trinitarian religion. Some call it polytheistic, a religion that worships multiple gods and goddesses. Others say Hinduism is monotheistic because it recognizes one supreme god ? the pantheistic principle of Brahman, that all reality is a unity. The trinitarian view stems from Brahman visualized as a triad: Brahma is the creator; Vishnu is the preserver; and Shiva is the destroyer. Hinduism might be best described as a henotheistic religion, which recognizes a single deity and other gods and goddesses as manifestations of the supreme god. Hindus believe in reincarnation, the continuous cycle of birth, life, death and rebirth through many lifetimes. Hindus call this samsara. Karma, the accumulated sum of a person's good and bad deeds, determines how you will live your next life. Through pure acts, thoughts and devotion, a person can be reborn at a higher level, eventually escaping the cycle of reincarnation and achieving enlightenment. Bad deeds cause a person to be reborn at a lower level. Wealth, prestige and suffering are seen as natural consequences for previous acts, both in this life and previous lives. The four aims of Hinduism: dharma, righteousness in religious life; artha, success in economic or material life; kama, gratification of the senses or pleasure; and moska, or liberation from reincarnation. Sacred texts include the Vedas and the Bhagavad Gita, a poem describing a conversation between the warrior Arjuna and his charioteer Krishna. Other texts include the Brahmanas, the Sutras and the Aranyakas. Meditation is often practiced; yoga is the most common form. Other rituals include daily devotions and puja, or ceremonial prayers. When Hinduism developed, followers were grouped into four social castes, plus a fifth group called untouchables. Jobs and marriage were determined by caste, and rules prohibited people of different castes from eating, drinking or even smoking with each other. The four castes: Brahmins, priests and academics; Kshatriyas, rulers and military; Vaishyas, farmers, landlords and merchants; and Sudras, peasants and servants. Dalits did not belong to any caste, performed menial jobs and were considered untouchable by the four castes. India has outlawed discrimination based on caste, but the system remains an important part of life among some Hindus, particularly in rural areas. On Nov. 4 in New Delhi, India, as many as 100,000 Dalits met for a mass conversion to Buddhism. Dalit leaders called conversion to another religion the only way to escape the oppression of their low social position.